Amongst the thirty thousand souls that peopled it the day I was there not one loud noise was to be heard, not one irregular movement was seen; the living tide rolls on quietly, with a deep hum like the sea heard from a distance. So wrote Charlotte Bronte after visiting the Great Exhibition of 1851. Today’s global exhibitions are the capital’s shopping malls, and the goal of managing public behaviour within them exists just as it did in Bronte’s time. How is such top-down control manifested through sound, and what can be heard when that management becomes less certain and less focused? Ian Rawes of the London Sound Survey will lead a listening exploration of two very different locations: the Elephant and Castle shopping centre and Westfield Stratford City, with time en route and afterwards for discussion. 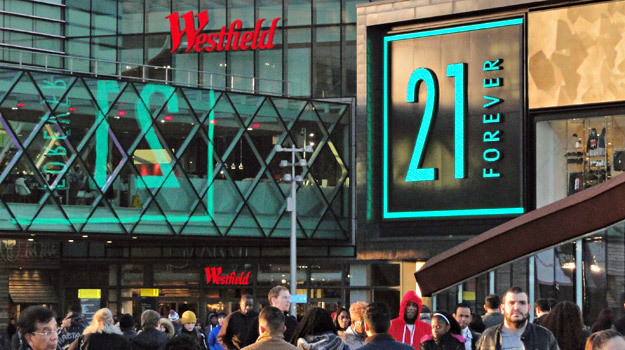 Westfield Stratford City is London’s newest and largest shopping centre and it forms a major hub in a part of the city already well advanced in its redevelopment. By contrast, the Elephant and Castle shopping centre, built in 1965 and now scheduled for demolition, has taken on many unforeseen uses. These include becoming a de facto community centre for the Colombian diaspora, as well as the growth of a surrounding hinterland with its open-air market and the occasional unlicensed minicab office. Participants are welcome to bring along discreet, pocket-sized recorders or binaural microphones. But thoughts and impressions jotted down with pencil and notebook will be just as valuable as recordings. Please also bring an Oyster Card topped up in advance to allow you to travel to Zone 3. Bulky, eye-catching equipment like DSLR cameras or microphones housed in blimp-style windshields should be left at home. Suggested reading in advance: Anna Minton (2009), Ground Control: Fear and happiness in the twenty-first century city.